Today’s guest post is by Dr. Mario Livio, Hubble astrophysicist and author of the blog “A Curious Mind.” A version of this post appeared previously on Dr. Livio’s blog. During the Christmas season of 1995, the Hubble Space Telescope was pointed for 10 consecutive days at an area in the sky not larger than the one you would see through a drinking straw. The region of sky, in the Ursa Major constellation, was selected so as to be as “boring” as possible — empty of stars in both our own Milky Way galaxy and in relatively nearby galaxies. The idea was for Hubble to take as deep an image of the distant universe as possible. The resulting image was astounding. With very few exceptions, every point of light in this image is an entire galaxy, with something like 100 billion stars like the Sun. The original Hubble Deep Field image. Detailed analysis revealed that the very remote galaxies were physically smaller in size than today’s galaxies, and that their morphologies were more disturbed. Unlike the grand-design spirals or smooth elliptical shapes that we see in relatively close galaxies, the distant objects look like train wrecks. Both of these observations fit nicely into the idea that galaxies evolve largely by “mergers and acquisitions.” Small building blocks merge together to form larger ones, or cold flows of dark matter along dense filaments fuel the growth. What we see in the distant past are those interacting—and hence smaller and less regular in shape—building blocks. 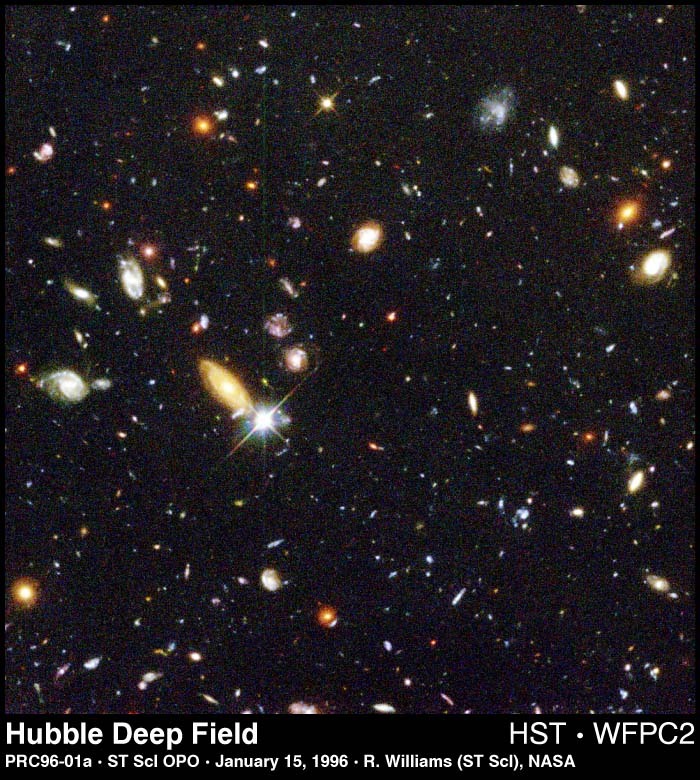 Since then, Hubble observed even deeper, producing the “Hubble Ultra Deep Field” in 2004, and then in 2009 an image that included infrared observations taken with the new Wide Field Camera 3. This observation allowed astronomers to glimpse the universe at its infancy, when it was less than 500 million years old (the universe today is 13.8 billion years old). The Deep Field observations have also enabled researchers to reconstruct the history of global cosmic star formation. We now know that about 8 billion years ago the universe reached its peak in terms of the new star-birth rate, and that rate has been declining ever since — our universe is past its prime. This tiny object in the Hubble Ultra Deep Field is a compact galaxy of blue stars that existed 480 million years after the Big Bang. Its light traveled 13.2 billion years to reach Hubble. The Chandra X-ray Observatory has created its own Deep Field observations, discovering hundreds of low-luminosity active galactic nuclei, where disks feed mass onto central black holes, and emit copious x-ray radiation. Infrared observations with the Spitzer Space Telescope completed the picture of the deepest images of the cosmos to date. Together, Hubble, Chandra, and Spitzer have created a detailed tapestry of a dynamic, evolving universe in which some two hundred billion galaxies are within the reach of our present telescopes. Currently, Hubble is engaged in observing six new deep fields, each one centering on a galaxy cluster whose gravity can deflect, multiply, and magnify the light from more distant objects (the effect is known as “gravitational lensing”). 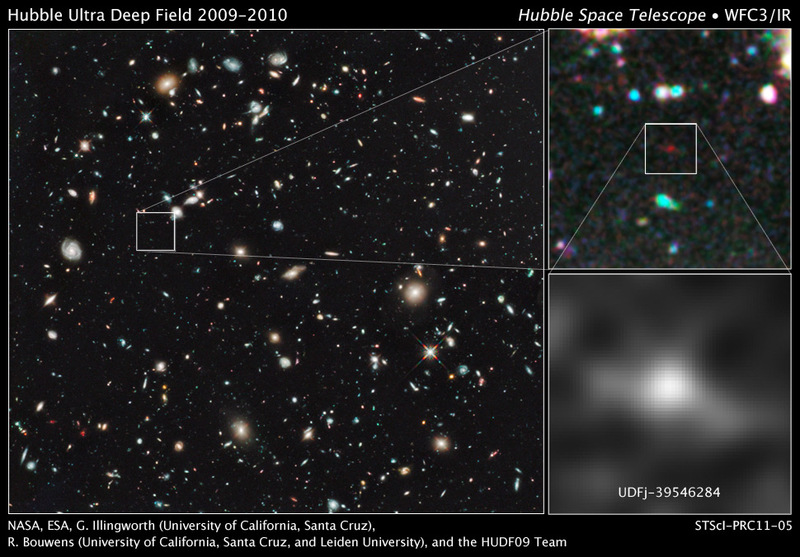 In parallel, Hubble will also observe six deep “blank” fields. 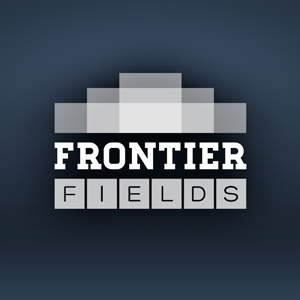 The goal is to use those so-called “Frontier Fields” to reveal populations of fainter galaxies, and to characterize the morphologies of distant star-forming galaxies. The first of these super-deep views of the universe has already revealed almost 3000 of previously unseen, distant galaxies. To see the very first galaxies that formed in our universe, we will have to await the James Webb Space Telescope, on schedule for launch in 2018. From a cosmic perspective, new discoveries are just around the corner! I have followed astronomy most all my life and love to down load pictures from the Hubble site and any others I can find and love to read about anything new that you astronomers find out. Ein Traum! Yippeeeeh! Durch Zufall habe ich herausgefunden, daß Hubble Space einen WordPressBlog hat!